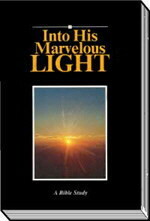 "Into His Marvelous Light", is a very insightful bible study that will take you through the gospel of Jesus Christ. they started in the Book of Acts. We believe the scriptures are divinely inspired and, "of no private interpretation" (2 Peter 1:20-21). Kingdom of God, must be born again of water and the Spirit. the Spirit. We find that scriptural belief is more than just a change in the way we think. It also results in a scriptural experience. for fear of what others will do or say. proclaim. The setting of the following great commission scripture in Luke 24:45-49 is just after the Lord's death, burial and resurrection... and just before His ascension into heaven. but tarry ye in the city of Jerusalem, until ye be endued with power from on high. of the Father is the baptism of the Holy Ghost. John 3:5 that were necessary to enter the Kingdom of God! Jesus, or when they were baptized, they were automatically filled with the Holy Ghost. But what does the Word say? re-baptize (if you were baptized by John the Baptist, would you think it would be necessary to be re-baptized using a different baptismal formula?) Others say it does not matter what is spoken when you are baptized. If the Bible indicates it does not matter, then it does not matter...but, what if the Bible shows us it DOES matter? of his revelation of who Jesus Christ was. original apostolic message of salvation for the first time. to dip. (see also Romans 6:3-4). as well as His death, burial and resurrection. continue to walk "into His marvelous light"!